Saturday, August 24, will be the official opening of the new Federation Park. There will be family entertainment including bouncy castles, face painting, sumo suits, the YAE Djing team, a balloon artist and dance performances. The Hon. Brendon Grylls MLA, Minister for Regional Development; Lands, will officially open Federation Park and the Water Spray Ground. Federation Park includes a new stage, shaded seating areas, new public toilets and barbeques and the water spray park. Exmouth is the official start of the Variety Bash on their 25th anniversary. It will be a colourful event with about 50 cars and the opportunity for young kids to hitch a short ride around town. Don't miss out on this great family fun day on August 24. 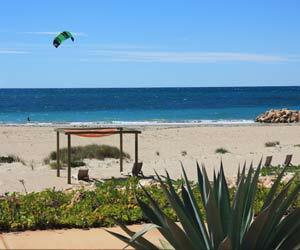 Your chance to visit Exmouth and get away from the winter cold! Rooms from just $242 per night for two people. Experience the North West in comfort. The Resort's spacious rooms and first class facilities give you the chance to really relax in style. See humpback whales splash about at Ningaloo. You may even see them from your private balcony. PHOTO: Humpback whales playing in the Exmouth Gulf. Another successful year for the Ningaloo Whaleshark Festival saw an increase in visitors to Exmouth. The Opening Cocktail Party was one of the highlights this year with a spectacular performance by international entertainers Patrick 'Patty' Heilmann and Chloe de Buyl Pisco. Their act, in and out of the Novotel Ningaloo Resort pool, with special featured lighting, kept the audience spellbound during a very intimate performance. The night was full of live music, cocktail food, refreshing beverages and laughter. Saturday activities included a fun run, a float parade, circus shows, live bands, BMX, gym and dance performances, book readings, a short film festival, and numerous food, retail and research stalls. A treat just for the +18 years group at Grace's Tavern featured Dave Mann and Blue Shaddy, a premier blues band, who returned by popular demand. The 'Gascoyne in May' troupe was seen throughout the weekend and ended the Festival with an amazing fire, dance and acrobatic show on the beach. The troupe is scheduled again for 2014. Congratulations Margaret Bertling on winning the Festival photo competition! (image to the right) Margaret won two tickets valued at $770 from Ningaloo Blue to swim with the whale sharks. Thank you to everyone who entered their photos. Another huge thank you goes to the Festival Committee and performers for making this year's Festival even bigger and better than the last. We hope to see you in 2014. Please click here to 'like' the Ningaloo Whaleshark Festival' page. The newest attraction in Exmouth was welcomed by 500 people from local and visiting families. The children were able to explore their new water spray ground and have the honour of being the first to experience it. 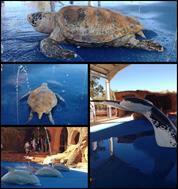 The water was turned on by Ningalulu, the Ningaloo Coast World Heritage Area Mascot, and the children loved her. The spray ground elements include a humpback whale, dolphins, turtles, a sailing boat with water cannons, and a cave where water flows out over steps, creating a safe water environment for even the youngest toddlers and babies. The grounds will be open 7 days a week from 9am-6pm. Click below to see more water spray ground images. The Novotel Ningaloo has new lounges by the pool. They're so comfortable that the only problem is you won't want to move! These lounges have adjustable shades so it's as simple as pulling the top over your head for less sun. Come and try one of the Novotel Ningaloo's famous cocktails while relaxing in the warmth of the sun on our new lounges. Our new bright red umbrellas provide even more shade for our guests. Click on the link below to book your next stay. There's fun for the whole family at the Novotel Ningaloo. Watch your kid's in the children's pool while you relax in the sun. At any time throughout the year, your family is welcome at Novotel. Bring the kids along to enjoy our spacious family rooms, complimentary accommodation and breakfast for up to two children (under 16) with late Sunday checkout (5pm* conditions apply). A children's menu is also available at the Gold Plate Award winning Mantaray's restaurant. Thank you to guests for the positive recommendations on our Facebook page. These comments are greatly appreciated and inspire our staff. We are thrilled that you enjoyed your stay at the Novotel Ningaloo. If you haven't already, please our Facebook page to be the first to see our specials and what's happening at the resort. Rajiv Punia is our new food & beverage manager. Rajiv was formerly the restaurant/function manager at the Waterfront in Port Melbourne. We welcome Rajiv to the team. It's a sad farewell and thank you to Heath Bentley, our food & beverage manager for more than three years. He will be missed by all and we wish him the very best in Perth. We congratulate our head chef, Joe Ditri and his wife, on the safe arrival of their baby girl. This amazing whale shark glass sculpture was created by craftsman Vaughn Bisschops. Vaughn and his son drove from Perth to display the sculpture by the resort pool to celebrate the Ningaloo Whaleshark Festival. It has since been bought by a WA philanthropist and donated to the WA Maritime Museum.